That was cut @50ipm 10ipm on plunge spiral lead in and .005" depth per pass. Ok the close up is not as good as a laser cut but sheesh its pretty good. The harmonics would have been better if the plate was not above the table like that. Very nice work. Thanks for sharing. Earlier you described the bit you used, but can you tell us the manufacturer and model of the bit? You had me sitting on the edge of my seat waiting for these pictures WOW! It's good to see that the MechMate COULD cut steel if need be. Yes you can do that with MM. I did that with a 2mm steel. After I loose a lot of time asking a friend to cut four pieces of 2 mm steel with his plasma cutter I finished the job with MM. Yes it can be done . Looking at a price to lasercut or waterjet (or plasma) a small steel part and comparing that to an carbide endmill and bearings in a spindle, preparation, oil and mess on a table, I would hesitate to recommend that a mechmate is ok to cut steel. Well the price for metal cutting (laser/water/plasma) for what I want done is well over 1000.00$ The cut was smoother than your thinking danilom, .005" per pass is really just going through the motions. Its not an aggressive cut at all. If my bearings wear out after this task Ill let you know. Not likely though. Preparation/oil and a mess? Come on. Having the ability to redesign/recut and make changes to metal parts in house is well worth anything negatives that "may" come about. Wood can only do so much, I really like the "structure" you can get from aluminum and steel. Like I said machines to build machines and I couldnt be happier. Jhiggens7: I linked some metal cutting bits on the amana site in previous posts. The price seams ok there. 60.00$ give or take. This is a site I got from this site, I have not purchased from them and I think I remember people saying they are spendy. The black tipped bits on the home page image look like what I have, (those have more flutes mine has 3) I think they are altin coated? Not sure on that. Sorry I cant get more specific on them the bit was given to me from a machinist who was discarding it. There is not a manufacture name on it. I appreciate the comments (good and bad ) and will share anything I know about it, I know its not much though. an example - from Mikes cvstore 8 x 4 belt reduction kits (8x132$) or 2 times all mechmate parts (2x520$) which include material (steel) and bending in cost. Could all that be cut with just one endmill? I am using US prices to compare, some prices I pay would cut that in half. - 40 passes (0.127mm pass) to cut 5mm, at 50ipm (1270mm/min) thats 30 min for one meter linear cut. - Mess... If you use your mechmate for daily woodworking, one metal chip embedded in mdf spoilboard will scratch chipboard surface, painted mdf, acrylic etc. Try to give that to a customer. Squirting oil stays on mdf and leaves staines, you can cover the machine in nylon to prevent that maybe. Router or spindle bearings are a long story I'll skip that. Using mechmate when you just need some part made and using it daily for what it is (cnc router) differs. After using MechMate for 4 years I just wanted to present risks trough facts to anyone reading this and thinking what a great idea and "lets try it" moment. No further comments. Stains and scratches?. Do DIY 220v industrial machine makers need warnings about stains scratches? Clean up or resurface. Its just clear to me that danilom is really reaching for anything to discredit the cutting of metal. Why so much effort to cast doubt about metal? Are metal customers not worth it? I think Danilom is just giving his opinions why not to do it - if you were him -, he's not saying it can't be done. Chopper, you, and others in the past have already been proving otherwise. I have done/made countless of weird thing with tools that we're not really intended to do so, which did not mean it did not work... Sometimes live calls for some ingenuity and improvisation. Did it go faster/better/quicker then the 'right' tool ? Most often not, but it got the job done, and saved me money and time on outsourcing, and I made my deadlines. Are there better tools then an MM for cutting steel ? Yes, I am a 100% sure about that. Neither one of you should try to convince the other, as your both 'right'. He's been contributing to the MM community and so are you. You both should drink a beer to that ( and Gerald ) ! Last edited by Fox; Sun 20 July 2014 at 13:33..
Danilo is a giving person. I totally share Danilo's opinion on. I totally understand how one's ego get bloated out of proportion after building a working MM from scratch. Been there.. I for one won't push that far based on the reasons Danilo stated & some... BUT don't take our words for it, have a go and feel the pain for yourself. I work with repairing industrial machinery. This machine should be used within its intended design. Will it cut metal....yes. Will it cause premature wear on the machine...yes. I am one that does not recommend cutting metal with this machine. However, if you do cut metal with a router or spindle, do make sure you have polycarbonate guarding in place. I work with a guy that had a bit shatter and a tiny sliver went into his neck. That bit was only spinning at 800 rpm on a conventional mill. At even the low end of 6000 rpm on a spindle the exiting velocity is much, much higher. I would say that the guarding is a requirement and not an option. The wear on my machine has impressed me (Gerald was still finishing the spider plate design when I started, Not saying that based on ego but as it relates to wear) and it has far exceeded what I thought it would. I am in the process of updating its components. So its going to happen. Bits break in wood too so safety is sound advice. Its all in the aggressiveness of the cut IMHO. Edit: I just notice Mods removed the rant. Thanks. No worries, everyone has an off day. Thats what the forum is for, discussion. I tend to like the diversity here and being able to see what others are trying on their machine. Maybe not everyone will operate their Mechmate the same, and thats ok too. Last edited by KenC; Mon 21 July 2014 at 23:56.. I have moded a few posts here to keep us focused on our MechMate discussion. If more is needed, let me know. I think the value of the MechMate design and community is that everyone can learn the value and limits of these machines from each other. Everyone thinks they have pushed this design to the edge, and then someone mods the platform or just takes their own ability to bring the platform to another level. Safety is your responsibility. No matter what your doing. If you think the platform can do it safely, then work it out and let us know. I like seeing people prove this platform is ridged enough to cut steel. We all know that we probably would not take the platform into full scale machining production since it is so slow in that space. But as we have seen, with the right bit and feed/speed, it can be done. So keep pushing. I am still looking for that 5 axis waterjet MechMate to go into service !!! I'm a wanabee machinist, trapped in a Mechmate body, with a "small machinist complex". and.. I'm ok with it. Well that killed at work. Maybe a little to serious around here lately? I'm looking at t5 10 tooth to t5 40 tooth reduction belt drive and am getting confused about belt length and tensioning. A: How do I calculate belt length, or do most guys cut and splice their own belts. If so how do you vulcanise the belt at home? B: How does the 'MetalHead' style welded reduction drive frames tension, I can't seem to make it out? 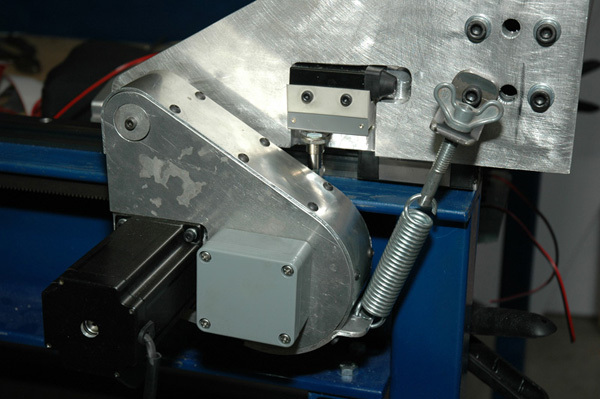 Do you just pull the motor tight in slotted holes and tighten the mounting bolts? Doesn't this slip? 10 tooth? wow, u using NEMA17 motors? u need some simple trigonometry maths or draw it in CAD to get the length. or search for manufacturer's tablets. "A:" I just buy belts I need... never have to bother with belts joining. "B:" is exactly how it is done. & it works. @Ken I haven't thought about the shaft diameter have I? What am I missing? And thanks for the quick answers. Why aren't builders using plastic pulleys, they are cheaper? Found this helpful page to assist in calculating belt length linked into SurfCNC's thread. I bought 15T T5 16mm pulleys with 12.7mm bores along with 45T T5 16mm pulleys for my 3:1 boxes. The 45T's are only 8mm bore so I will need to make mine bigger. I might still get some 44T as I can get those in 12.7 as well, that would reduce my ratio to 2.933333. All these are from AusXMods here in Aus, for the 4x 15T, 4x 45T and 4 suitable belts it all came to $102 including shipping. I doubt you will get the 10T bored to 12.7mm to suit your motors, you'll need to increase the tooth count. @Bruce Thanks for the tip! Why not go the extreme with GT2 timing belt & pulley. you might be able to get 8:1 ratio if you don't mind fat & clumsy look. These are a couple of pics just to give you more ideas. I don't have any drawings. And this is obviously not a mechmate. Same principals apply though. Keep the relationship between the pivot and the pinion shaft no more than 45 degrees from horizontal. I would make it less if I was starting again. I see the weak point of other designs to be the pivot mechanism. Any slop here goes straight to backlash. Whenever I drill a hole and put a bolt or shaft through it, it usually ends up with about 3 to 5 thou slop. Then the rapid back and forth of the axis will increase this with wear. That's why I put bearings on the pivot and made them a firm fit in their housing and on the shaft. Also be careful in your belt selection. Mine are T5 and the "cog" on the belt is smaller than the "groove" on the pulley. So far this has not showed up in accuracy but this is not a good place to start. 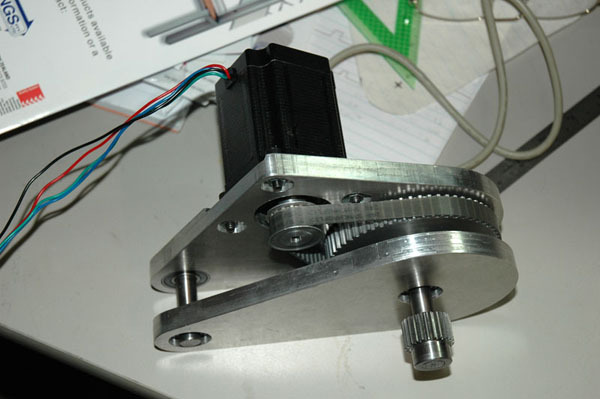 Hi, has anybody built belt reduction gearboxes using aluminium timing pulleys? If so how has it worked out? I was looking at steel ones but the aluminium seem to be more readily available and with a wider choice. Also I was going to go for a 15 tooth to 60 tooth pulley arrangement but most of the 15 tooth pulleys I have found would not be able to be drilled out to fit the 14mm shaft on my stepper motors and still take a grub screw. Any suggestions? All of mine are aluminum pulleys. I have a 7 to 1 ratio with my largest pulley custom made from a gear maker out of Massachusetts. No issues with wear. Thanks for the feedback. Does anyone have any preference over gear profile? Lots of people seem to use XL or T5 but I have seen references that GT2 is better at minimising backlash. I use sometimes HTD 3M belt and pulleys with conical axle grip . Here are some pics again. The belt drives can be built pretty easy . I would recomend having the stand offs made on a lathe but everything else can be done with a hand drill as I made mine with nothing more than a hand drill just to see how well they would work. I have sold about 20 sets of these have not had any bad feed back so far. If anyone needs the drawing or a parts list just PM me. I put these belt drives on my machine in late 2009 I use my machine every day and cut a wide range of products, today 3/9/2019 is the first day I have had to do anything with my belt drives as I broke a belt today and came on here to find my old part number to reorder some more belts. Thankfully my parts list was still posted so if you're ever wondering if these will hold, don't as they hold up great. Also thanks to the Mechmate site for still having my post up.